The Audi e-gas project demonstrates how large amounts of green electricity can be stored efficiently and independently of location by transforming it into methane gas and storing it in the natural gas network, the largest public energy storage system in Germany. 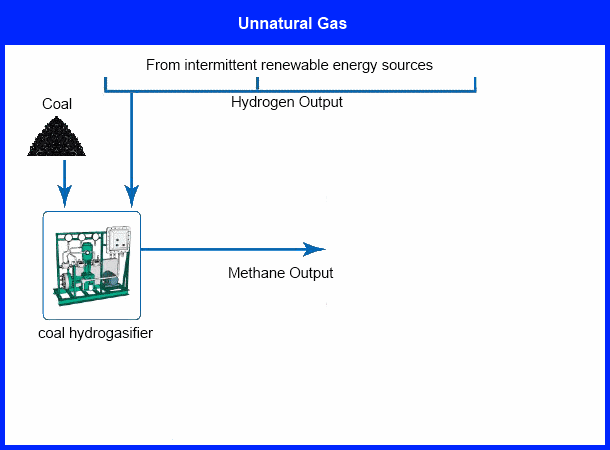 The e-gas plant utilizes a two-step process: electrolysis and methanation. First, the plant uses surplus green electricity to break water down into oxygen and hydrogen in three electrolyzers. While the hydrogen could one day power fuel-cell vehicles, in the absence of an area-wide infrastructure, a second process step is carried out directly: methanation. The hydrogen is combined with carbon dioxide (CO2) to produce synthetic methane, or Audi e-gas. Audi said the efficient use of energy flows was the top priority in the plant’s production sequence: The waste heat given off during methanation is used as process energy in the adjacent biogas plant, significantly increasing overall efficiency. In return, the biogas plant supplies the highly concentrated CO2 required as a basic building block for e-gas. This CO2 thus serves as a raw material and is not emitted to the atmosphere. 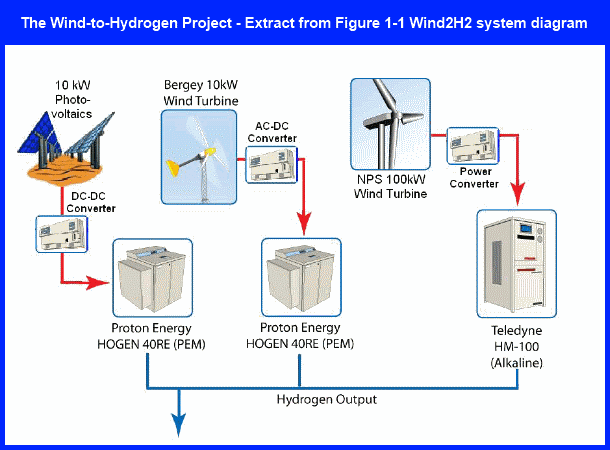 The US National Renewable Energy Laboratory (NREL) in partnership with Xcel Energy launched a wind-to-hydrogen (Wind2H2) demonstration project at the National Wind Technology Center in Boulder, Colorado. The Wind2H2 project links wind turbines to electrolyzers, which pass the wind-generated electricity through water to split it into hydrogen and oxygen. The hydrogen can then be stored and used later to generate electricity from an internal combustion engine or a fuel cell. Storing Energy in Hydrogen. “The larger the share of electricity production accounted for by renewable sources such as the wind and sun, the greater will be the fluctuations in the amount of energy available,” says Dr. Manfred Waidhas from the new Hydrogen Electrolyzer Division at Siemens’ Industry Sector. If demand for power rises, the energy-rich gas could then drive a turbine to supply CO2-neutral electricity to the grid. If you combine the efficiency of the electrolysis (approx. 75 percent) with that of a gas turbine (around 60 percent in combined cycle operation with a steam turbine), the resulting “energy-recirculation” process would still exploit up to 45 percent of the original energy. “That’s not as good as a pumped-storage plant, but it’s better than shutting down windmills when demand isn't there,” says Waidhas. E.ON is developing a pilot plant in Falkenhagen in the north east of Germany to convert power from wind energy into hydrogen which can then be stored in the country’s gas grid. The company is investing over EUR5 million on the pilot plant and further research into this innovative technology. Using power from renewable energy sources, the plant will produce about 360 m³ of hydrogen per hour from 2013 onwards through electrolysis. The hydrogen will be fed into the Ontras gas pipeline system and be used like normal natural gas. This makes the gas grid a storage system for power from weather-dependent renewables. "Unnatural Gas" Methane that contains 50 percent fossil fuel energy (from coal) and 50 percent renewable energy (from wind and/or solar). can be used as fuel in any engine, fuel cell, trigeneration power system or power station that runs on natural gas to generate electricity. In comparison, coal is far more limited. For example, natural-gas fueled power stations can achieve 60 percent efficiency. Coal-fired power stations can achieve little over 35-40 percent efficiency. Coal cannot be transmitted through natural gas pipelines so it cannot be easily distributed for fuel in trigeneration power systems. Coal gasification technology can convert coal to methane and carbon dioxide. With carbon capture and storage, this carbon dioxide could be stored. The methane that is produced possesses about the SAME amount of energy that the coal contained before being gasified. However, if coal is converted into methane by combining it with hydrogen, no carbon dioxide is produced during conversion. There is no need for carbon capture and storage technology. The methane that is produced possesses about TWICE the energy that the coal contained before being gasified. Dr Waidhas of Siemens' Industry Division notes about hydrogen from renewables: "If you combine the efficiency of the electrolysis (approx. 75 percent) with that of a gas turbine (around 60 percent in combined cycle operation with a steam turbine), the resulting “energy-recirculation” process would still exploit up to 45 percent of the original energy." Combining the efficiency of the electrolysis (approx. 75 percent) with that of a trigeneration power system (around 80 percent), the resulting “energy-recirculation” process would exploit up to 60 percent of the original energy. Converting the coal to methane and using it in a trigeneration power system (approx. 80 percent efficient) instead of a coal-fired power station (about 40 percent) would exploit 200 percent of the original output energy. The overall effect is that total energy delivered is equal to the output of the coal from a coal-fired power station plus 90 percent of the original renewable energy. An example illustrates these results: 10 KWh original renewable energy will directly contribute about 6 KWh after the electrolysis, hydrogasifier and trigeneration cycle. The coal added in the hydrogasifier will deliver about the same amount of energy - another 6 KWh. Had this coal been used as fuel in a coal-fired power station, it would have delivered only 3 KWh. Thus, the total output of 12 KWh is equivalent to the original 3 KWh from the coal plus 9 KWh of the original 10 KWh from the renewable energy source.